Darwin’s work on emotional expression is less well known than his more theoretical writing on evolution, or his more specialist geology, zoology and botany. But it was an integral part of his broad research on human evolution and was one of the main bodies of evidence for the descent of humans from animals. Darwin’s earliest observations of expression are recorded in his Beagle diary, in notes about the behaviour of native peoples, particularly the Yahgans of Tierra del Fuego. His transmutation notebooks from the late 1830s contain many entries on particular emotions, such as grief, joy, fear, and guilt: how did such emotions originate? Were they purely instinctual, or acquired through learning and fixed by habit? Did animals have comparable feelings, facial movements, and gestures? Another important source of information for Darwin was infants. Darwin recorded observations of his own children, beginning with the birth of his son, William Erasmus, in December of 1839. Entries on his other children followed, and the record was kept through 1856. Darwin’s wife, Emma also recorded her observations in the same notebook. Darwin concluded that the facial movements, bodily gestures, sounds, and other physiological changes that accompanied and expressed emotions were largely instinctive, vestiges of behavioural modifications that had occurred in our animal ancestors, and that had originally given competitive advantage. Darwin also collected images of various expressions. He obtained pictures of animals displaying emotions and worked with illustrators to produce drawings and engravings of monkeys, horses, dogs, and cats. He acquired photographs of infants and young children, ethnographic portraits, images of asylum patients, and a photographic album showing a series of expressions generated through a galvanic process. He also commissioned several London photographers to capture specific emotions. Darwin used the photographs as emotional specimens. He was keen to establish whether the images, especially those produced in the laboratory setting by artificial means, were accurate, and he devised his own test of their authenticity by showing them to family friends and guests. You can find out more and take part in an online recreation of that experiment here. Darwin did not publish on expression for many years. He had famously avoided the subject of human evolution in Origin of Species (1859), and then embarked on a series of botanical studies and a large scale work on variation in domestic plants and animals. He returned to the subject of expression in 1867, and began to test his theory and to expand its evidentiary base. He gathered information on emotional behaviour in non-Europeans through a questionnaire, originally hand-written and later printed, which he sent to correspondents who were in a position to observe native peoples, or who were in contact with missionaries or travellers. Darwin received replies from South Africa, Ceylon, India, China, North America, and Australia, and was able to chart similarities and variations in expression across the globe. See the replies in both interactive map and table form. Darwin originally intended to publish his work on expression in Descent of Man (1871), but the material grew too large and required a separate book, The Expression of the Emotions in Man and Animals (1872). Darwin incorporated some of the wide-ranging information that he had gathered over nearly four decades in his book, but substantial material, both visual and textual, was not included, perhaps because it was not deemed directly relevant, or because it was too controversial, or for simple reasons of economy. Some of the replies to Darwin’s questionnaire contain descriptions of the violent circumstances under which various emotions were observed, while the racist sentiments of the colonial settlers toward native peoples are equally manifest. Leading physiologists and medical specialists reported detailed observations and experiments conducted on Darwin’s behalf, investigating the reflex activity of the facial muscles, and the nervous structure of the eye. Lengthy descriptions of the emotional pathologies suffered by mental patients were provided by the asylum director, James Crichton-Browne. Numerous friends and family supplied observations of their infants weeping, or their dogs expressing devotion. These pages highlight the importance of Darwin’s correspondence for the study of emotional expression, and make available other manuscript material documenting Darwin’s long-running interest in this fascinating subject. 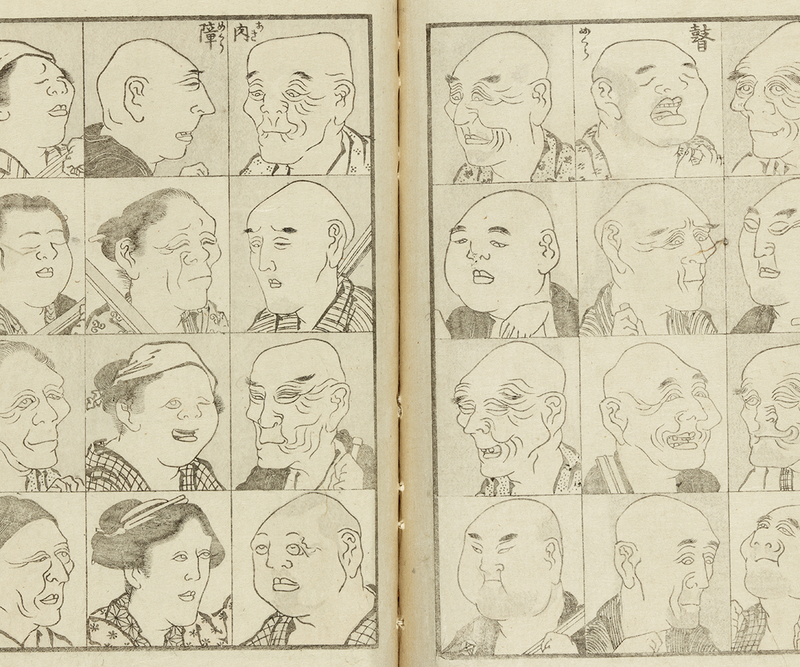 In 1876 Darwin was sent a copy of Hokusai Manga, a collection of Japanese drawings including two pages of human and animal faces.